Doesn’t seem like much, right? 3. That [name of defendant]’s negligence was a substantial factor in causing [name of plaintiff]’s harm. Just like it sounds, a personal injury involves harm to someone’s body and mind. Whether by accident (Negligence – as above) or by design (Intentional), people get hurt all the time for all kinds of reasons: Automobile accidents, trip and falls, dangerous products, the list is endless. Our job is, first and foremost, to listen to your story and examine the evidence. A person must use reasonable care in driving a vehicle. Drivers must keep a lookout for pedestrians, obstacles, and other vehicles. They must also control the speed and movement of their vehicles. The failure to use reasonable care in driving a vehicle is negligence. 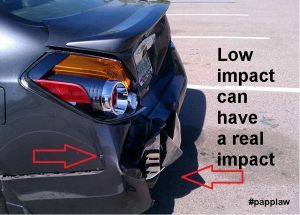 Low impact collisions and soft tissue injuries sometimes called MIST (Minor Impact, Soft Tissue) can have major consequences for the human body and your wallet. The amount of damages must include an award for each item of harm that was caused by [name of defendant]’s wrongful conduct, even if the particular harm could not have been anticipated. [Name of plaintiff] does not have to prove the exact amount of damages that will provide reasonable compensation for the harm. However, you must not speculate or guess in awarding damages. Everyone is responsible, not only for the result of his or her willful acts, but also for an injury occasioned to another by his or her want of ordinary care or skill in the management of his or her property or person, except so far as the latter has, willfully or by want of ordinary care, brought the injury upon himself or herself. Click link for a complete listing of the Judicial Council of California Civil Jury Instructions (CACI).